This final week as been pretty busy, to say the least. Fortunately for us, with good team work and time management we were able to complete all our tasks in a timely and orderly fashion. On Monday, we had our final meeting with Ms. Tomaszewski and received all 3500 printed flyers. Unfortunately, the flyers were printed four to a page and we had to cut each flyer out individually by hand so they could be put in each student’s mailbox. We finished up this task around lunch time and were able to give our flyers to the mail-room before the day was over. After this we went to the project center to practice our final presentations and our advisers gave us some very helpful feedback and recommendations. On Tuesday, after working at the ReStore in the morning, had a meeting with Worcester State University’s sustainability coordinator, Steven Bandarra. Although he had heard of the ReStore and was willing to contribute, he said due to state mandates donating to ReStore wasn’t as simple as we had thought. He said that even though students could donate to ReStore individually, Worcester State could not as they have to make a list of all the items that are still “ use able” and send them to a state supervisor. He also said that Worcester State holds a “Ditch the Dumpster” campaign at the end of the year in which most students donate a lot of materials to give to Clark’s Thrift Store for refurbishing. Mr. Bandarra did say he would be interested in talking to the ReStore so we left his contact information with Ms. Hoak to follow up next week. On Wednesday, we had our final presentations. Although we had numerous presentations before hand and practiced multiple times, we still had some “butterflies”. Fortunately, after a rocky start, we were able to finish our presentation on a strong note and received some great feedback from the audience, especially Mr. Firment. On Friday, after we submitted our paper on Thursday, went back to ReStore and organized all the work we had completed in our seven weeks. We did this so we wouldn’t just leave the ReStore without saying goodbye and leave everything a mess. We wanted to structure our work so that tomorrow, when we are no longer here someone could just pick up where we left off. 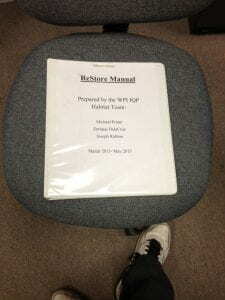 Also, we printed out and created our ReStore Manuel that gives step by step procedures of the work we completed and how any Habitat employee can easily duplicate it. 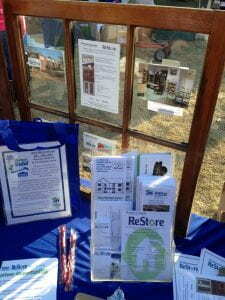 We hope ReStore is successful in the future and we will definitely be in contact to help out in their future endeavors. Lastly, I just wanted to thank Professor Golding and Professor Dehner one final time as without them we wouldn’t have been able to accomplish so much in such a short period of time. In our last day of contributing to ReStore’s mission, I was organizing the Tracking sheet for Year-to-Date donations. Debbie had asked me several weeks ago if I could track donations for the past year so I quickly created a template so that in the future ReStore could track their donations month to month, day by day. This excel file is simple to use and operate since it has functions inserted into the file. So when new donations are gather and entered, the excel sheet will count the number of donations per month as well as totaling the entire years worth of data. The end has come and our time here at ReStore is up. Since the beginning of our seven-week project, I did not think that we were going to see the light of day from working so hard on this project. I feel a bit sad that we are leaving already today but at the same time I am glad to see ReStore grow more with the WPI community. Being that this was Habitat’s first time working with WPI students to complete an IQP here in Worcester, it was a great success! As our last week approaches, we fortunately managed to reach our goals. The spring cleaning campaign is in full effect and we set out flyers and emailed the school about the event. The giftworks and all other procedures regarding what we’ve done is now officially in our guidebook that we’ve left for ReStore. 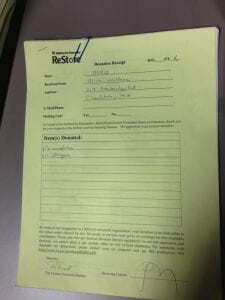 The surveys and questionnaires have been completed and handed off to the ReStore staff. It is amazing to see what we have accomplished and now that everything is done, I am proud of myself and well as my partners that we have done all of this good work. I can proudly say that this has built all of us in different ways and I will gladly go back and visit ReStore. As the final weeks are approaching, it has been a rush to get everything done. On Monday, we meet with Elizabeth Tomaszweski, Facility Systems Manager and Sustainability Coordinator of WPI, to introduce our idea of a “Spring Cleaning” campaign to WPI. Although the other colleges and universities that we had met with were cold to the idea, Ms. Tomaszewski was very interested. She said that we had very good timing as she was trying to coordinate an event like this earlier that day. She gave us the contact information for the Director of Residential Services, Emily Balcom, and Student Activities Coordinator, Christine Girouard to work with them. Unfortunately on Tuesday, they responded and said this was more of an off-campus event and they would rather not get involved. On Tuesday through Thursday, I created a tracking sheet for the Habitat for Humanity ReStore program. This tracking sheet had two different sections. One was the Facility Managers information for all the college and universities in the Worcester Consortium even including Mass Academy. The next was all the community service contact information for any colleges, universities, and high schools that had previously worked with Habitat for Humanity in the past. I feel like this tracking is going to be beneficial to the organization as I researched all the current position so all the information is now updated. Also, on Wednesday I called Worcester State and scheduled an interview with their Facilities Manager for next Tuesday afternoon. I also scheduled a meeting with Ms. Tomaszweski for Friday afternoon. We finished writing up our proposal before we met with her in order to determine what days the ReStore truck would be on campus and how this event would be organized. On Friday we meet with Ms. Tomaszewski again to finalize our “Spring Cleaning” event proposal. We went through the details and decided that it will be a two day event. The first day will be May 1th (the day after classes end) and then May 8th (the Wednesday before graduation). We all decided that these dates would work best for both the WPI and ReStore’s schedule with the Boyton parking lot (the one across the street from the goat head) being the designated drop spot. Ms. Tomaszewksi said she would print off copies of our flyers and help us distribute them to the local businesses like Woo-Berry and the Boyton the spread the word better. We have high hopes for this event and hope we get so much stuff ReStore doesn’t know what to do with it! As the end gets near, our team has grown in vast amounts of experience regarding how to approach the community. With that we have gotten a better grasp on how to approach our most recent project, the “Spring Clean Up”. This campaign has been created to help the Habitat ReStore gain more publicity, at the same time to target undergraduates, graduates and even faculty and staff to donate any goods they may not want. The end of the year is coming to and end so we will be having a few dates where we will focus on these individuals. With the help of our advisors and Habitat for Humanity employees and staff, we were able to get a better understanding of what dates would be beneficial to both graduating seniors and underclassman. Through out this week I was able to organize some information that the ReStore manager had requested, which was the number of donations per donation type (pick-up or drop-off), taking consideration of their respective zipcode to see where these people are donating from. Do you see the video camera that is setup on the corner of the wall? Yes, we were video recording the ReStore floor on Friday which will be used for our commercial that we have been compiling footage through out our term on IQP. It was a good idea to capture as much recordings as possible in order to get the full ReStore experience and also to show exactly how ReStore works for the people that dont know what it is. This past week has been a “keep busy week”. Mike, Enrique, and I had plenty of work to do as we sat at the computers during majority of the week. The giftworks is well populated and the questionnaires are in full effect. Giftworks is now in motion to gain more information as time goes on and will reach out to donors In the near future. I met with Tim and Deb regarding the questionnaire and we worked through some kinks to make it official and ready for the floor. The donor questionnaire is ready to be used and the customer questionnaire will now sit at the register and have a coupon attached to it. Customers will be asked to fill it out and if they do take the option, they get the coupon. As for the “spring cleaning campaign”, we now have a set proposal for the event that will take place on May 1st and May 8th. The proposal includes having the truck sit at a site from 10am-12pm so students/faculty can donate their furniture or set an appointment for late that day from 1-3pm. The same procedure will occur on both days. After meeting with Liz, the WPI facilities manager, she has agreed to confirm our event and is going to work with us to mke it all happen. 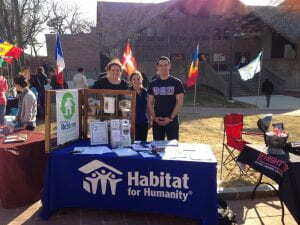 I’ve also contacted the Habitat for Humanity group on campus to help advertise and set up the event, we are still waiting for a reply. Filming has also begun for our group video. However, our video is planned to be different and more professional. Our hope is that this video can also be used as a commercial film for ReStore to use! This week at ReStore has been different then the last couple. We had high expectations as we had set up a meeting with the Holy Cross facility manager and had a “Woo-Card” event at Clark on Friday. Sadly it did not turn out as we had hoped. Earlier in the week, however, we continued making strides in “Giftworks”. By now we have a good idea of how the program works and have started a “Donors List” excel file to keep track of all the recent donors. We also continued to gather data, but will probably not have time to do this as efficiently as the first few weeks since the term is coming to an end. Throughout the week as well I continued to contact colleges to hopefully set up more meetings with facility managers. Clark, however, replied and said they were not interested so that put a damper on setting up a “Spring Cleaning” campaign with them. While I was still waiting to hear back from Worcester State, I set up a meeting with WPI’s facility manager, Liz Tomaszewski. This meeting will hopefully solidify our ability to organize a pilot “Spring Cleaning” campaign at the WPI campus. On Friday we had a meeting with the Holy Cross facility manager, John Cannon. During our interview, he said he had been their facility manager and sustainability coordinator for over 11 years. Throughout the conversation, we learned that Holy Cross would not be interested in a “Spring Cleaning” campaign as the school has an Eco-Action Club that runs “Trash for Treasure” event every year. This event enables students who are moving out to bring any item to a designated location on campus on a specific day (usually on graduation day) to be donated to the Salvation Army. Although this was disappointing, Mr. Cannon was quite helpful and willing to share the Holy Cross process as we create a similar event for other Worcester area colleges and ReStore. After this interview we went to Clark University to table sit. Luckily for us, it was decent weather for the first half of the event so there was a big turnout. Joe, Enrique, and I all walked throughout Clark’s campus and talked to varies students and explained what ReStore is. Most of them seemed fairly interested and willing to help out, but mostly through volunteering since most students lived on campus. Students were also attracted to our table through the game called “Price is Right”. 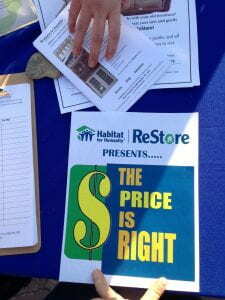 In this game a student guesses the retail price of an item and then its Restore price. If he/ she guess within $200 of the ReStore price, they win a free tote bag, and if they guess them both right, they get a 10% off coupon to the ReStore. As the weather started to get colder, we decided to hit the library, mailroom, and student activities office to hand out more flyers. We put so many on tables and in so many mailboxes that we ran out of materials! Pictured from left to right: The” Price is Right” game, our spring cleaning flyers, and ReStore brochures. As for our new goals for next week, we just received a contact list from one of the office workers at Habitat. We hope to contact as many high schools and organizations as we can in order to market ReStore. Stay tuned! The group after a hard day’s work. Pictured from left to right: Joe, Molly, Mike, Enrique, and Alex. Another task we focused on was working with Giftworks. Since time is going to be one of our greatest obstacles, we have to get data from the donors into the tracking system including donation areain order to start pulling valuable information regarding demographics from where people are coming from to donate. We also have another tracking system that will be on google survey and will be used to gather the information we gather from our questionnaires. With this we hope to gather qualitative data since we have been asking our interviewees how they heard about the ReStore. 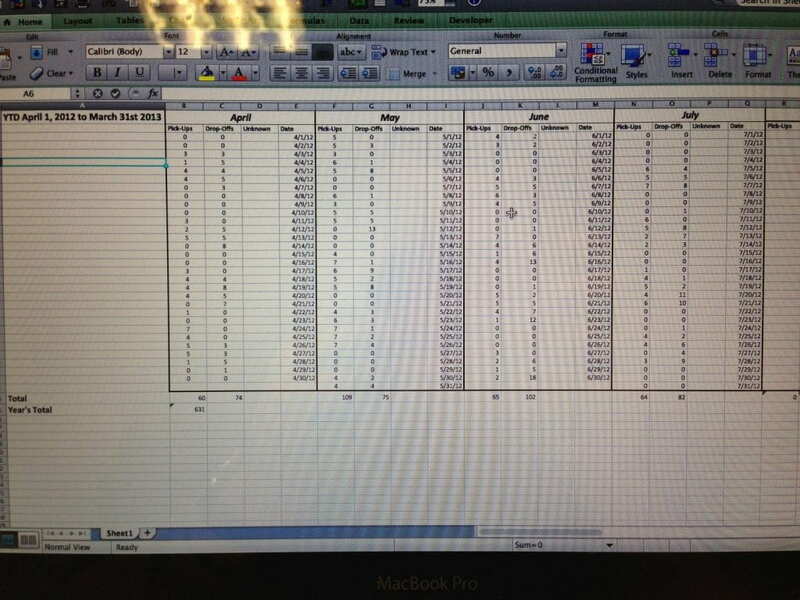 Here is a snapshot of what our donors list looks like on excel, which later will be transfered into Giftworks. As with the questionnaire information gathering, Giftworks has also been our focus this past week. By taking the donors receipts, as you see below, we are getting good data, such as the addresses of donors, zip codes, phone number, what exactly they donated, and if the donation was a truck pick-up or donor drop-off. This is a Donation Receipt that ReStore uses to gather their donors information. With the information collected from the questionnaires and the categories set up this past week, google survey will be able to provide graphs and tables to show ReStore it’s current statistics and changes over time. For data such as types of furniture and geographic area, google survey will be able to create and present pie graphs that can easily show what category weighs heavier than the other. With other data such as whether or not people are interested in hearing about ReStore news and updates, google survey compiles a list of addresses that can later be transferred into giftworks and its email strategics. Giftworks is our main tool that has been started this past week and will spread the most information in the most efficient ways for ReStore. With the two strategies, we hope to continue populating them and be able to leave ReStore with helpful ways to keep organized and updated on its publicity. When it comes to technology of the publicity objective, these two strategies are what we will be working hard on for the upcoming weeks. We hope to populate these databases as much as possibe with our own additions that will come from our campus visits at Clark this past week and our “Spring Cleaning Campaign.” Proposals have been started this week and we’ve began finding contacts of who to reach for our possible partners. Like Mike said, Holy Cross was a fail. However, we still learned the fact that schools are willing to participate because we just found one that created its own sinch it was such a great thing to do. We have faith in this campaign and now have to find the schools that aren’t doing anything about it yet. With our list that has been provided to us this past week, we are going to reach out to many schools and continue our interview process. Hopefully we will get better feedback and find partners for this great cause next week! Our IQP this week was very stressful, but definitely worth it. On Tuesday afternoon our advisers and sponsors threw a lot of new information at us regarding our project, but we were able to understand it and accomplish our weekly goals. Right after our meeting on Tuesday we had our initial training of the “Giftworks” software. It seemed like a very easy program to learn at first, but there are still some bugs we have to work out for it to be effective. After this we finalized our questionnaire sheets, especially the ones for our field trip to Lowell, with Debbie and started putting our questionnaire information on Google survey so all our information can be easy accessed in one place. Lastly, I got Clark University, Worcester State, and Holy Cross’s facility managers information from Liz Tomaszewski and contacted them to set up a meeting time. I cannot wait to hear back from them as this would beextremely beneficial to our project. The ReStore at Lowell. As shown, it displays itself perfectly knowing that there is a high traffic road next to them. On Wednesday we spent the afternoon in Lowell, MA visiting another ReStore. It was very beneficial trip as we learned some new marketing strategies and how different ReStores promote differently to their respective customers. We hope to utilize some of these new marketing tools and will be running them by Debbie next week as we hope they will effective. One technique which we thought was quite unique was an informational sign that states what items can be donated to the ReStore. Proper ways of getting to know what can be donated and what cannot. One main thing I noticed was that this ReStore used to be an old car dealership so their items are very organized in different rooms. Also, their location is key to their success as they are in the middle of a busy intersection and have friendly relationships with neighboring businesses. From top to bottom: This was one of their strong holds, where items from ReStore are used to setup a stage, purposed for presentation. On the right photo, we see a sausage stand, which pays rent for its presence and also attracts more people since food is also a gateway to reel customers into ReStore. On Thursday we had our first build day! It was probably one of the best experiences I have had in my entire life. 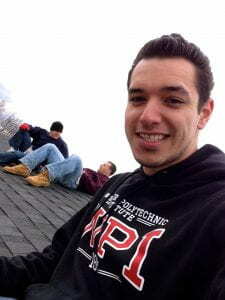 Joe, Enrique, and I all shingled a roof! Getting directions for our next task of the day! Although I am personally afraid of heights, I was able to overcome my fears and hammered over a 100 nails into the roof. I took a lot of great pictures and videos and can’t wait to make our commercial. We also interviewed most of the builders and got their input on how they use the ReStore and how we can market it more effectively. Tune in next week for more information! This week at ReStore we became familiar with the last and final part of the ReStore cycle and we continued a deeper dive into our marketing methods. We kicked off the week with learning the GiftWorks software that ReStore uses to track its donors and inventory. 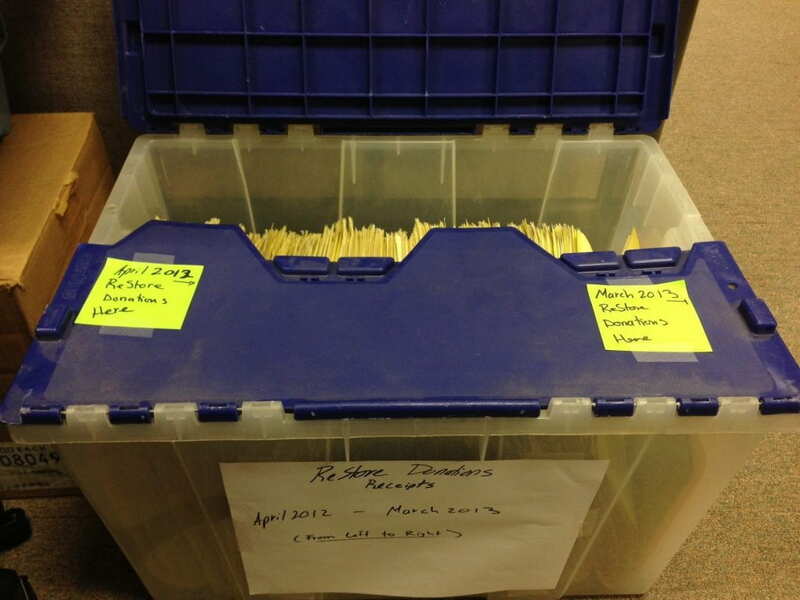 This is the main database where donor information is kept in file, with information of what was donated. After learning what Giftworks was fully about, we began to change our excel documents to match the Giftworks format for import purposes. 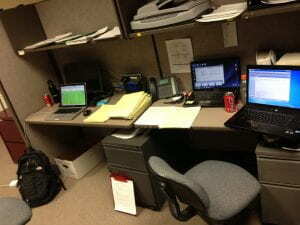 After we learned this software and made changes to our current questionnaires, it was time to take a new step forward. On Wednesday we took a trip to the Lowell ReStore and became familiar with how another ReStore functions. We interviewed employees/volunteers and customers to get a general idea and opinion of the success of ReStore. Here we see Michael interviewing the Lowell ReStore Manager, as she tells us interesting facts about this store. The information being recorded since we started is now being transferred into Google surveys which will give us a graphical depiction of our findings so far. With this new data, we will have a better scope of work and where to take our next step. 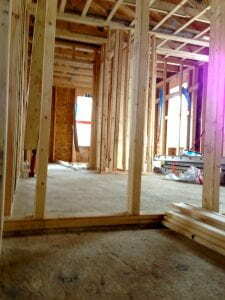 On Thursday, we had our first visit to a Habitat for Humanity build site. We spent the entire day building the new home. The build was a great experience. We had the opportunity to learn the personalities of those who volunteer to help build and realized just how important Habitat’s and ReStore’s work is. Now it’s time to get the ReStore name and mission out there and get more people involved. Joe in the top left corner of the picture, Michael on the bottom left and habitat volunteers in the center hammering down some shingles onto the roof. Like my teammates have said, during this past week we shifted into higher gear and really got the ball rolling. This week was filled with new experiences and ideas by taking a look at the Lowell ReStore and further realization of Habitat’s Mission through the end product of helping build the home on Plantation street. From Top to Bottom: These are the ways that sinks are displayed at the Lowell ReStore. Even though the Lowell store is much smaller than the one in Worcester, carts are used for easier access and movement of items customers are shopping for. Also this week, we research additional marketing methods and gained insight during our sponsor/advisor meeting on Tuesday. At this meeting, we decided to reach out to building contractors as well as Worcester based government agencies for potential furniture/produce donation to the Worcester ReStore. We also increasing utilization of Craigslist or Digerslist since we have discovered that they have been useful marketing tools in the past. Here are some more pictures of our build day at Plantation Street, it mostly consisted of hammering down shingles, chatting with the Habitat volunteers, enjoying the view from above, freezing our faces off and in fact completing an entire side of the roof as shown on the 5th picture. This links is small clip on how we were hammering the shingles, once we got to the opposite side of the roof. Click here to see IMG_1420. Next week, we hope to bring in some clips for our commercial video. Mike- Although ReStore was closed on Tuesday due to the snow storm, it was still a very interesting week. At the beginning of the week I finished making the interview templates for the donor, employee, customer, and builder interviews. This enabled us to organize our information and compare the answers more readily. When I interviewed Debbie, the ReStore Manager, she was just finishing up with a customer and I thought nothing of it. As it turns out, right before the customer left we realized that he was actually stealing an item already purchased by someone else. Debbie had to take back this item and ask the gentlemen to leave. She was very upset about it, as was I, because who would try and steal from a non-profit organization! Eventually Debbie joked around and said that he wouldn’t be doing that anymore since she now had Joe, Enrique and me to chase him down. Towards the middle of the week, I had a discussion with Tim Firment, Executive Director, about us taking a trip to the Lowell ReStore to get first hand knowledge of their marketing strategies. Consequently, I planned a field trip to the ReStore in Lowell, MA for next week. I finalized this trip today and it will be next Wednesday, for most of the morning and some of the afternoon. 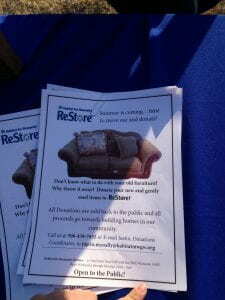 We will be sitting with that ReStore’s director and learning how they reach out to their local communities. Hopefully we can gain some new insight from them about marketing techniques as they are pretty popular in Lowell. Also, Tim has set us up for a build day next Thursday and I am very excited to finally get on site and help out. This will also enable us to ask the tradesmen questions and hopefully promote the ReStore more to them. Finally today, Friday, we visited our first school. At WPI we set up a table in the odium and tried to promote the ReStore to students in the Campus Center. Enrique made the flyers about the “Spring Cleaning” campaign and Joe and I hit the ground floor talking to students and faculty explaining ReStore to them. I put a lot of my stack of flyers on empty tables as well bulletin boards so students who weren’t there can hopefully learn about ReStore. Our advisor, Louis said there was a good turnout and thanked us. We also set up our next event which is April 5th at Clark University. Tomorrow, Saturday we are excited to learn about and get trained on “Giftworks.” This will enable us to create this tracking system and help ReStore for years to come. Continue to read our blog to learn more about our progress! Joe- This Week at ReStore we started our marketing methods. Since we have not had a chance to learn giftworks, I created an excel document to track the information from ReStore. With three different tabs (Volunteers, Donors, and Customers) we can now filter any information regarding people involved with ReStore. We have classified many groups such as their location, reference, and company names so that we can easily track them in the future. With our tracking efforts begun, we have begun processing all the past contacts involved with ReStore. 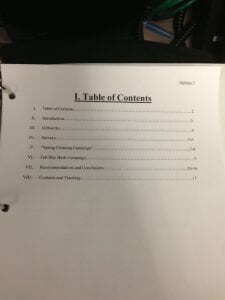 From this we can have all the information on a soft copy instead of being stacked in a binder. We also created questionnaire templates off of the excel file for store and interview usage. On Friday, we had our first visit at a school. We visited the WPI campus and table sat with some T-shirts and flyers. 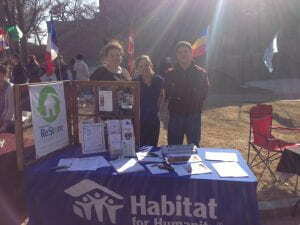 There we spent time interacting with students and faculty about ReStore. We even had a successful little game where people had to guess the price of a piece of furniture and it was always proven that ReStore sells it for cheaper than the retail price. A lot of people were amazed and had no idea such a store existed in Worcester. We had a lot of success and plan to hand flyers out to the WPI mailboxes at the campus center and possibility send the flyer as a mass email to all of WPI’s students and faculty as a next step. In two weeks we’ll do a similar process at Clark University. Enrique: This past week was interesting. With yet another winter storm that hit us on Tuesday, our team was unable to attend the ReStore since they closed this day, but we did in fact work on our project behind the scenes. Starting on Monday with a meeting with our advisors and sponsor gave us the chance to assemble an adequate plan for the week. Since we were out on Tuesday, it gave me the chance to work on some more background research regarding the marketing of other organizations such as Savers and Goodwill Industries, Inc. I stumbled upon some interesting things about branding and brand alliances and what they can do to improve the publicity of products or services of the jointly comprised organizations that work hand-in-hand. I also had the chance to experience riding the ReStore truck. It gave me a good understanding of the amount of effort that the Habitat employees put forth into working and let me tell you, the destinations can vary from one county to another on any given day. I also interacted with the donors which was nice because I got to ask them the questions our team created in order to get a better understanding on how people are discovering Habitat for Humanity’s ReStore. Through these donor interviews I was also able to acquire demographic information, and why they donate to ReStore . So that was a great experience. The last two days of the week, my team and I were office rats working on our project writing, compiling the data that we received from past questionnaires, and creating a flyer for the WOO Card Event that was held today, Friday the 22nd at WPI, of course with the help of the ReStore Floor Manager, Louis Garcia. According to Louis, this event was a success, since we had more students come up to the table than ever before. Thats always a good thing right? All in all, it was a good week and I keep on learning more ways of interacting with donors, volunteers and customers. As for tomorrow, we will be working at the Worcester ReStore in order to start learning a database that will be used to keep track of vast amounts of information in an organized fashion. Enrique: Since the beginning of this week, we have been learning how ReStore operates within the warehouse. I had a general idea of how things got done here, but after spending some time with the employees, there is a more organized flow of operations. The first few days I got a feel for how items move around the store, helping customers with purchases and donations, and helping organize the floor space and items in ReStore. We also started to interact with customers, donors and employees by asking them series of questions that will start to help our marketing efforts for ReStore. One thing that caught my attention was that there is much traffic going into ReStore and a large quantity of items sold each day. Also, people have said that the sheer quality of things that are found here is what keeps them coming back again for more. This surprises me because one would think that donations consist of worn down items, but the ReStore products are in good condition and many people have commented that they like the quality the ReStore offers. Something that also started giving me a different point of view is the importance of presentation. Here at ReStore, presentation is what it is all about. Having a couch accompanied by pillows, a small coffee table and even some magazines on the table can alter how people see at that particular item. It definitely does sell faster! Michael: When I first walked into the ReStore on Tuesday morning I was anxious to get started. I had been preparing all of C-term to make an impact and it was finally time to implement our team’s ideas and strategies. During orientation we met with Deborah Hoak, the ReStore Director and she introduced us to the other ReStore employees. They were all were very polite and thankful for our help. Mrs. Hoak then gave us a tour of the ReStore and we were very impressed by the amount of goods they had in stock. Although they have a vast amount of goods, we learned that newer products sold better than older ones and this was one area where they wanted us to help. Since we were new to the store, we decided that for the first couple of days we should learn the ropes and how things get done in the ReStore. During the beginning of the week, I rode in the ReStore truck with Justin, the Donation Coordinator, and we went from house to house picking up donations. This was a different experience for me as I had never seen so much furniture and appliances at one time. Donors were giving away anything from a coffee table to a whole dining room set. After I helped move all the furniture to the truck, I asked the donors a couple of question like: “How did you hear about ReStore?” and “Why did you choose ReStore over other non-profit organizations?” The questions that I asked also gave me a good idea about how the ReStore gets its name out there and why people continue to donate to the ReStore. Continuing with this during the end of the week, I interviewed ReStore employees as well as customers to get their input as to what they feel needs to be improved. All this information will hopefully lead us into next week where we will share our initial findings with our sponsor and discuss some initial ideas on how to optimize operations around the ReStore. One great experience I had was on the very first pickup. The lady who was donating had just lost her mother and she was giving away all her old furniture and appliances. She was crying and while I was consoling her she said thank you to me and that she was donating to ReStore because she wanted to have her mother continue to help people even after she had moved on. This experience really touched me and reminded me of the importance of the work I will be doing for the next several weeks. Joe: The first week at ReStore has been a learning experience. Our main goal of the week was to learn how ReStore functions throughout the day. We worked as volunteers in the warehouse to help customers and move furniture to appropriate places whether it was donated or bought. This week we learned the cycle or flow of material in and out of the warehouse. It is amazing how the cycle works so efficiently within the warehouse. On some days furniture was donated in the morning and was already sold later that day. If only ReStore had more donors, there would be more customers because of the amount of quality material in the warehouse. When helping customers, we started to get a feel of what brought them to donate or buy from ReStore and what they like about it. The atmosphere is very respectful and when it comes to the staff, there seems to be no hierarchy. Everyone works together at ReStore and there are different volunteers each day. On the ReStore truck, loads are picked up throughout the day and brought back to the warehouse when the truck is full. When going from destination to destination, the volunteers pick anything that is salvageable and do it swiftly. It is key for the volunteers to be personable to gain the donors appreciation and someday use ReStore again or refer a friend. When I asked how the donor has heard of ReStore, different answers were given each time. The answers reflect the reason we are here and doing this marketing program. Many people simply don’t know of ReStore and its benefits. If they did, more material would have been donated and sooner.